The Feelies‘ 11-song opening set on night 2 included a handful of their old favorites, and the following day they played a headlining show in NJ at Asbury Lanes with a 31-song set that included two new songs and covers of The Velvet Underground, The Stooges, The Doors, The Rolling Stones and The Beatles. Setlists from both Feelies show and both nights of YLT at Town Hall, below. 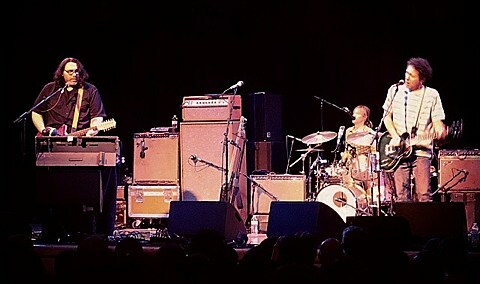 Yo La Tengo and Antietam also played The Troc in Philly on 12/6 after the NYC run, and you can listen to an audio recording of Antietam’s full set over at NYC Taper. One song from it, “Hands Down,” can be streamed below. YLT’s Ira Kaplan and Georgia Hubley also just performed this week at Jon Spencer and his wife/Boss Hog bandmate Cristina Martinez’s holiday party. Bust was there and posted this Instagram, as was Jon Spencer producer Chris Maxwell who posted the one above. Yo La Tengo’s next show is New Year’s Eve in Boston at the Hynes Convention Center. Tickets for that are on sale now.